Moons Icy Mission - Universe Galaxies And Stars Section. More Information About Icy Moons Mission. Icy Moons: Image credit: NASA/JPL. 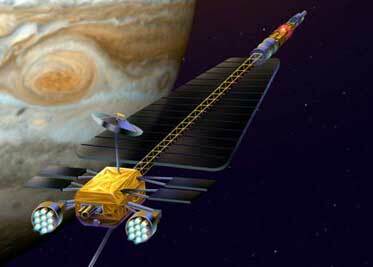 NASA has released more detailed requirements for its upcoming mission to Jupiter's icy moons. The Jupiter Icy Moons Orbiter would travel to the Jovian system, and then spend time orbiting Callisto, Ganymede and Europa; each of which might have liquid oceans under their icy surfaces. The mission would be powered by a nuclear reactor, and use ion propulsion to get into and out of various orbits. The Request for Proposal has been delivered to Boeing, Lockheed Martin, and Northrop Grumman, and they have until July 16, 2004 to deliver their conceptual designs. NASA has issued its mission design requirements to three industry teams for a proposed mission to Jupiter and its three icy moons. The requirements are also the first product formulated by NASA's new Office of Exploration Systems in Washington. The Jupiter Icy Moons Orbiter is a spacecraft with an ambitious proposed mission that would orbit three planet-sized moons of Jupiter - Callisto, Ganymede and Europa - that may harbor vast oceans beneath their icy surfaces. The mission would be powered by a nuclear reactor and launched sometime in the next decade. Associate Administrator retired Rear Adm. Craig E. Steidle of NASA's Office of Exploration Systems said, "The Jupiter Icy Moons Orbiter requirements represent our new way of doing business, tracing exploration strategies to the technology maturation programs that will enable this exciting mission and the other missions that make up Project Constellation." The Request for Proposal was released this week to the three previously qualified industry teams led by Boeing, Huntington Beach, Calif.; Lockheed Martin, Denver; and Northrop Grumman, Redondo Beach, Calif. These three companies are currently working under study contracts investigating conceptual designs for the mission. The proposals are due July 16, 2004. The scope of the initial contract is to co-design the spacecraft through the preliminary design with the government team. A contract modification will be issued after preliminary design to implement the design, to integrate and test the spacecraft and to integrate the spacecraft with the reactor module and mission module. JPL would be responsible for delivering the mission module, which would include instruments procured competitively via a NASA announcement of opportunity. The launch vehicle will be supplied by NASA. The Department of Energy's Office of Naval Reactors would be responsible for the reactor module. To ensure the technologies demonstrated are consistent and coordinated with the Vision for Space Exploration, Project Constellation is managed within the Office of Exploration Systems. "Although the Jupiter Icy Moons Orbiter mission may not launch until the next decade, the study of revolutionary new technologies in spacecraft design is underway in the areas of power conversion and heat rejection, electric propulsion, radiation hardened electronics and materials, and telecommunications," said Karla Clark, industry studies lead and deep space avionics project manager for the Jupiter Icy Moons Orbiter Mission. Three cross-cutting science themes identified by the NASA- chartered science definition team would drive the proposed Jupiter Icy Moons Orbiter science investigations. The themes are to evaluate the degree to which subsurface oceans are present on these worlds; to study the chemical composition of the moons, including organic materials, and the surface processes that affect them; and to scrutinize the entire Jupiter system, particularly the interactions between Jupiter and the moons' atmospheres and interiors. "The scientists have told us what they want," said John Casani, project manager for the Jupiter Icy Moons Orbiter mission at JPL. "When you consider the five-to-eight year trip to Jupiter, going from one Moon to the next, not only flying by but orbiting each moon, this will require a unique nuclear power and electric propulsion system. The large amount of power required for electric propulsion could be used in orbit to power a significantly enhanced suite of instruments not even conceivable with previous power systems." The Jupiter Icy Moons Orbiter mission is part of NASA's Project Prometheus, a program studying a series of initiatives to develop power systems and technologies for space exploration. The Jupiter Icy Moons Orbiter, managed by JPL, would be the first NASA mission utilizing nuclear electric propulsion, which would enable the spacecraft to orbit each of these icy worlds to perform extensive investigations of their makeup, history and potential for sustaining life. The Jet Propulsion Laboratory, a division of the California Institute of Technology in Pasadena, manages the proposed Jupiter Icy Moons Orbiter mission for NASA's Office of Exploration Systems, Washington, D.C.